This building is in great demand because of many factors, among which is incredible walkability to restaurants, shopping and entertainment. It boasts wonderful amenities, swimming pool, hot tub, tennis courts, and beautiful social room for entertaining. 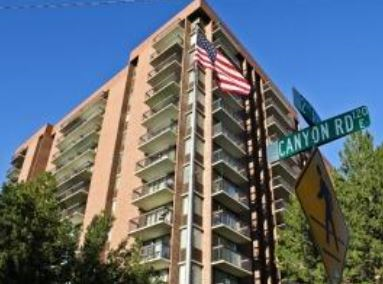 Canyon Road Towers is just a few blocks away from City Creek Mall, Harmons Grocery, the Trax (SLC transit) and just one block to Temple Square. The building is surrounded by parks, which makes it seem like you aren’t in the city at all. Very close to the north is Memorial Grove Park with all its trails and steps up to the Capitol. The new Eccles Theater is walking distance as well. The HOA fees cover all utilities and amenities except for your telephone and internet. The Homeowners Association pays all utilities and amenities including: gas, electric, water, basic cable, swimming pool, hot tub, tennis courts, sauna, recently updated exercise room and building insurance. Each condo comes with it’s own storage unit. As an added bonus Google Fiber is in the building! Quiet living with easy access to downtown, The University of Utah, Avenues, Capital, and many more!